The Claddagh ring and its fabled history can be traced to 16th century Ireland so along the way varying folklore and rituals have developed. 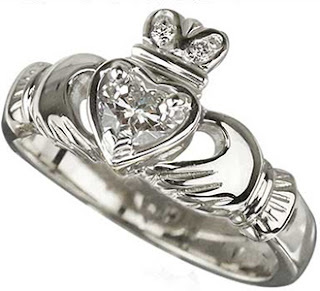 A Claddagh ring is such a sentimental piece of jewelry that many considerations have evolved over time that have been forged by unique family traditions and experiences. Over the years we have heard several Irish family traditions from our customers that relate to the Claddagh ring; one of these traditions include that a Claddagh ring may only be worn as a wedding ring. Even though it is often called the Irish wedding ring there is not a requirement that this special Irish ring must only be worn as a wedding band as it is also widely utilized as an engagement ring. Additionally, the rituals of the Galway Folklore explain that a Claddagh ring may be worn to indicate that you are in an unengaged relationship or even that your heart is free. The gift of a Claddagh ring may be shared between anyone who is dear to you; this may include lovers, friends and of course family members. Additionally, while some subscribe to the notion that a Claddagh ring may only be worn by a female, we must report that there are many available men's Claddagh rings. Another opinion, though less common, is that a Claddagh ring must be received as a gift and never purchased for oneself. While the receipt of a gift is always appreciated, you may buy one for yourself if you are so inclined. Most legends of the Claddagh ring stipulate that the original design was crafted from gold, so it is easy to understand how some may mandate that only gold is the acceptable metal. However, gold is not a requirement of an genuine Claddagh as the ring is readily available in silver and many other precious and non-precious metals. An area of typical agreement is that Claddagh rings should be made in Ireland, as is the case with all our selections at The Irish Gift House, but in our global economy that is not always the case. Irish made jewelry is unique in that by law all precious metal is hall marked by the Irish Assay Office at Dublin Castle, so you can be guaranteed that your Irish jewelry is truly made in Ireland. Just look for the hall mark stamped on the inside of your Claddagh ring If you have any doubts. To be a true Claddagh ring there must be three essentials present: in the center a heart that symbolizes love, on top of the heart is the crown that symbolizes loyalty and holding the heart are two hands that symbolize friendship. Stone settings are completely optional but it is often very desirable have diamond Claddagh rings and emerald Claddagh rings from which to choose. Not surprisingly there are many different versions of the Claddagh legend; so who is to know which version is correct? The Claddagh history that we use at The Irish Gift House is the same version that was supplied to us by O'Connor Jewelry. O'Connor Jewelry was the Irish jeweler that in the late 1940's opened the Claddagh ring market in the United States, so we figure they knew what they were talking about. We would ask our original Irish jeweler how they came to use their particular version of Claddagh history, but sadly both Thomas O'Connor and his son James have both passed on and the company has been defunct for many years. As long as your version of the Claddagh ring history references the Galway fishing village of Claddagh and the three elements of the Claddagh ring, heart, crown and hands, you are on the right track. Below is the O'Connor Jewelry version of the enchanted Irish legend that has been used at The Irish Gift House since 1994. Incidentally, we supply a copy of the Claddagh ring history along with a card with the Galway Folklore that explains how to ware your ring with each Claddagh purchase. Claddagh Ring History - Early 16th century legend tells that a fishing boat, from the village of Claddagh in County Galway, Ireland, was captured by pirates and the crew taken as slaves. One of the crew-members, Richard Joyce, was to have been married the same week he was captured. His bride-to-be was inconsolable.